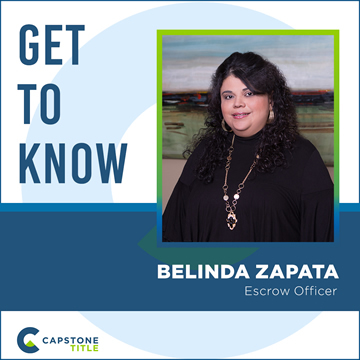 Belinda Zapata is featured in our "Get to know the Capstone Title Team" series. Belinda is a Residential Escrow Officer as well as a Commercial Escrow assistant at our Rollingwood location. 1. What is your favorite childhood board game? 2. Who is your favorite band or musical artist? 3. Where is your happy place? 4. What is the best trip you have taken? 5. What do you love about working at Capstone? I love that we are family oriented, we are not a corporate environment and love our team building events. Capstone is by far the best job I have ever worked at. Copyright © Capstone Title. All rights reserved.